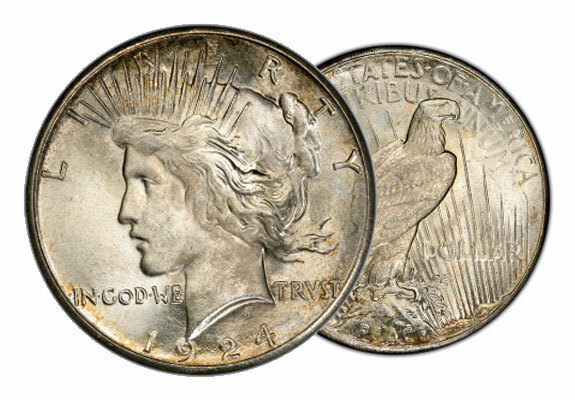 The Peace Silver Dollar, designed by Anthony DeFrancisci, was first produced in December 1921 following a large mintage of Morgan Silver Dollars that same year. The idea for a coin to commemorate the peace following World War I came from Farran Zerbe, former President of the American Numismatic Association from 1908 to 1910 and active promoter of numismatics, particularly during the first quarter of the 20th century. The obverse (front) of the Peace Silver Dollar Coin depicts the Goddess of Liberty, facing left, wearing a diadem of spikes (in somewhat similar style to that seen on the Statue of Liberty). “Liberty” is above, while “In God We Trust” and the date are below. The reverse (back) side shows an eagle perched on a rock with a laurel branch, with “Peace” inscribed below. “United States of America” and “E Pluribus Unum” are above, while “One Dollar” is to be seen just below the center. Rays of an unseen sun emanate from the lower right. Peace Silver Dollar Coins are considered numismatic, meaning it is a coin that typically has a higher value than its face value, due to the historical significance of the coin. Numismatic coins are highly coveted by coin collectors because of their history and potential value. For more information about purchasing Peace Silver Dollar Coins, call American Bullion at 1-800-326-9598 to speak with a precious metals specialist.